This is a serious post but please if possible take the time to read it, especially if you have a dog who loves the water. It may save their life. 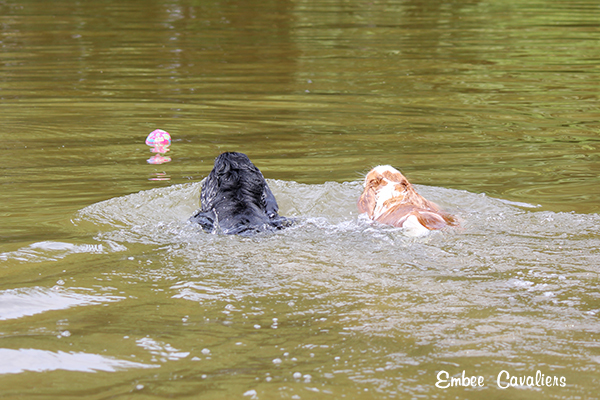 Embee puppy owners know that the puppies born here have a certain joie de vivre about them. They are athletic and smart, fun loving, have no fear, and their whole goal in life is to please you; no matter the task or adventure. This happens to be the temperament that I personally love and will always aim to keep in my breeding program, however it also comes with some challenges. 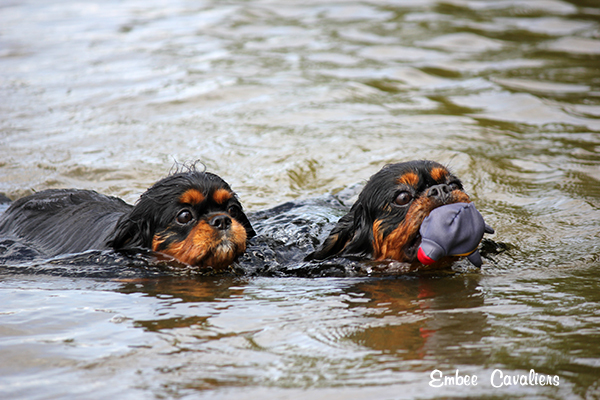 My fun loving Cavaliers tend to have have trouble with self control, knowing when to stop, and self regulating. They will fetch and hike until they drop, they don’t think twice about jumping off of bridges into water or running across the road, and chasing bunnies will almost always be more exciting than coming when called. A Saturday afternoon started no different than any other for one of my puppy owners. Her boys really have the best doggy life and are truly looked after to perfection. High quality food, a work at home “mom”, regular trips to the groomer for nail clipping, a few days a week at doggy daycare, and daily walks and adventures. On this day they decided to go to one of their favourite conservation areas and spend the afternoon hiking and swimming. 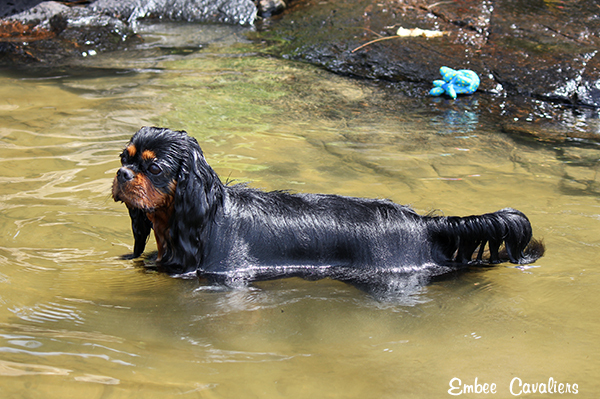 Like a typical Embee Cavalier her boy adores to fetch and swim, and if you can combine the two.. even better! What was different was they ended up staying longer than usual. A couple good friends had joined her and she wanted to make sure that they knew where the best spots were to take their Cavalier. Instead of going to one or two spots to swim, they went to all of them. An hour outing turned into well over 3 hours. 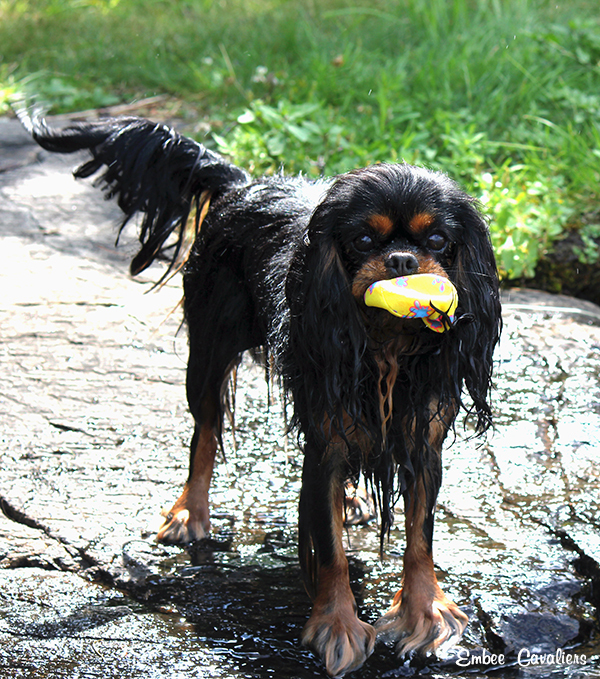 The boys were having a fabulous time running, swimming, and fetching from the water. They were dirty, wet, tired, and it was time to head back to the car to go home. She said goodbye to her friends and went to leave when she noticed her boy was acting a bit strange. His eyes looked a bit glazed over and he seemed disoriented. He then threw up a ton of water, foam, and some grass and lost control of his bladder. She quickly loaded in the car to take him home, thinking he had just ate something and would feel better by the time she got there. On the drive things quickly progressed from bad to worse. He was becoming more and more disoriented and unresponsive, instead of heading home she made the life saving choice to take him to the closest Veterinary emergency clinic. By the time he arrived he was very lethargic. His heart rate had bottomed out and what had been a very fun afternoon was now a life threatening emergency. The clinic was able to stabilize him and give him medication to up his heart rate. They ran some blood work and could tell that his electrolytes were very low, but they did not know what the cause could be. Due to how severe his symptoms were they felt it was best he be transferred to the Ontario Veterinary College(OVC) in Guelph where he could receive better diagnostics and care in their ICU. His loving owners transferred him to OVC, a 35 minute drive from the emergency clinic. Along the way they gave me a phone call to let me know what was happening and wondered if I could offer any advice or ideas about what was going on with their boy. Thankfully I was home to take their call and offered to go and meet them at OVC. By the time we reached OVC his heart rate had dropped low again and he had begun having seizures. His brain was swelling and he was completely unresponsive. 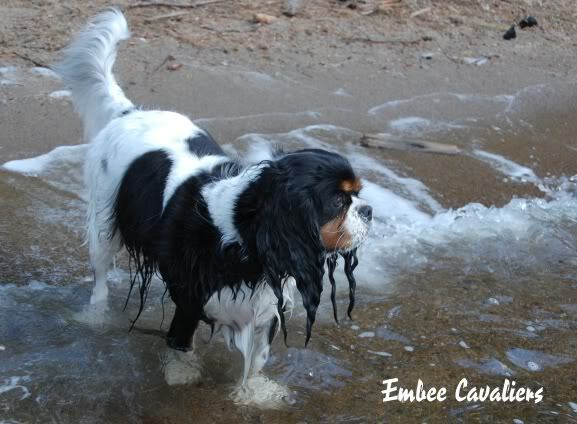 Several years ago I belonged to a online Cavalier community and Suzie a member at the time lost a dog to delayed drowning. Following the heartbreak of losing her girl there had been several discussions about delayed drowning and water intoxication and I became very well versed on the subject. There was no doubt in my mind that we were dealing with one or the other, and it was very possible that the outcome was not going to be positive one. Over half of these dogs do not make it, even with early treatment and intervention. While we were waiting for news I messaged Suzie on Facebook for some suggestions and support. Because of her courage to share the story about losing her girl Pixie, she saved this boy’s life. By 11pm, OVC was able to get our boy stabilized but he was still unresponsive and showing signs of brain swelling and severe neurological damage. He was finally administered diuretics and he was on IV to slowly raise his electrolyte values. At last we were allowed in to see him and the reality of how sick he was quickly set in. I took a few moments and said my good-byes to this sweet life loving boy, I did not believe he was going to survive until morning. Over night a true miracle happened. All the excess water was making his way out of his system and things were returning to normal. His electrolytes were up, his heart rate normal, he stopped having seizures and he awoke responsive and looking for his owners. He was discharged home later that afternoon. I fully credit miracles and the true resilience of this special little breed for saving his life. After only a few weeks this little man is almost 100% back to his normal self and his owners are enjoying every moment possible with him. Life is truly fragile and can change in an instant. This boy’s day to day life will not change much. He will still enjoy playing fetch, going for lots of walks and adventures, and swimming every opportunity he can. What will change is the amount he is allowed to swim at one time and how much fetch he is allowed to play in the water. He can’t regulate or make smart choices about water for himself, but fortunately for him he has very loving owners who will always be able to watch and manage him carefully. “Hyponatremia occurs when more water enters the body than it can process. The presence of so much water dilutes bodily fluids, creating a potentially dangerous shift in electrolyte balance. The excess water depletes sodium levels in extracellular fluid (fluid outside of cells). Sodium maintains blood pressure and nerve and muscle function. To a happy and safe rest of summer for everyone. Thanks for sharing this story. 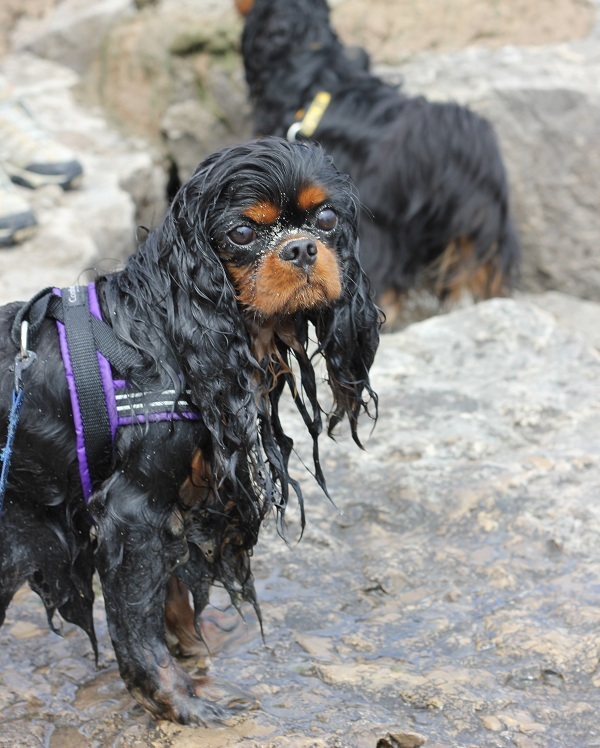 There has been quite a lot of attention this summer on delayed drowning in children so this is a timely reminder that dogs can suffer from similar things. So glad to hear this little dog made it. I'm grateful for the post, wonderful learning. This pup owes his life to his caring person, but even more so to a committed, knowledgeable and loving breeder. If only every breeder could be this invested. Mary Beth, This exact thing happened to a puppy owner of mine. It was 45 minutes in a pool. It was very very sad, and this girl did not make it. I have tried to educate everyone i know, but often, people just don't believe this can happen. Unlike people who swim and spit out the water intake, dogs swallow it. Thank you for writing this very important article about a danger that not many know about. 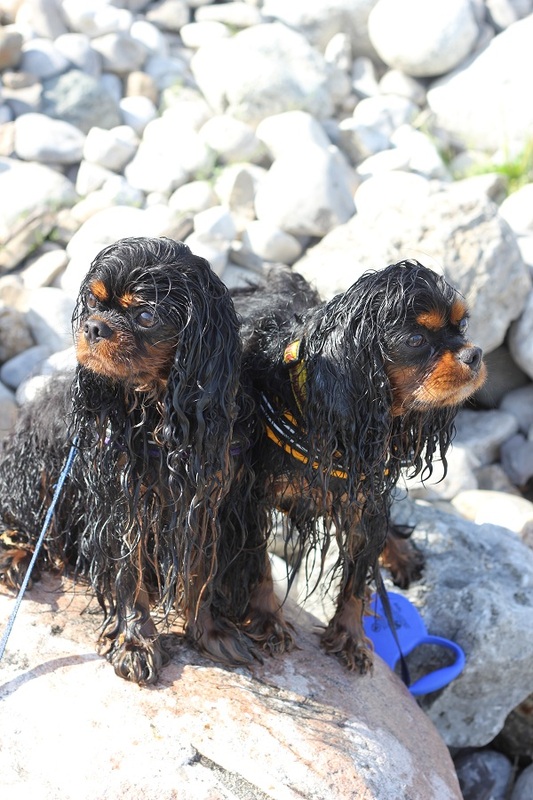 I remember Suzie and Pixie's story from the cavalier web board days. I am so so glad that this little boy's story ended happily and that Suzie sharing Pixie's story saved his life! This, or something very similar, happened to our Cavalier three years ago when out in a row boat a well meaning relative, tossed him in the water to retrieve a tennis ball. Long two weeks…. Sounds like the same symptoms….. Your story or cautionary tale is good to broadcast in some ways. But rather than painting the university as the good guys who worked tirelessly to save a life, you made then look like unempathetic fools who only turned a deaf ear and blind eye. I'm an emergency vet and I'm also not the type to get offended by every little thing, but reading this made me frustrated. Giving diuretics to an animal with electrolyte imbalances is very risky and takes a long time to prepare and give the injections. Every vet is aware of the existance of "fluid overload" and I promise you they believed you if they were willing to treat for it (I've never treated a critical case a certain way just because the owner or breeder asked me to… I have to have my own reasons to believe it might help), even if it seemed it was only on your insistence. I'm not accusing you of anything, I just worry that stories like this make people so untrusting of a vet's professional opinion. You should absolutely advocate for your pet, but also remember your vet is trying to advocate for them too (you're on the same side). I'm glad it came out alright. Thanks for writing and commenting. I appreciate your feedback and have edited my original post to be a bit less harsh. It was a highly emotional day and there were several things to be upset over. I appreciate the challenges of Veterinary emergency medicine but also want to be respected as a knowledgeable client. A year later, a bit of a softer tone is the way forward as the more important part of our story is education. Without their care, we wouldn't have our boy. This is extremely good to know. One of my Cavs. will retrieve and swim until he is pooped. How long is too long? Does it depend on body weight? We want to rescue a puppy but after our summer heat. We are getting all the info on this breed, and I'm SOOOO glad this was posted. Thank you from the bottom of our heart! Thank you for posting this. I had no idea that this could happen and will share this information with all my canine loving friends.